I was rummaging around my stack of drawings the other day and found a few cartoons that, for whatever reason, haven’t been posted. 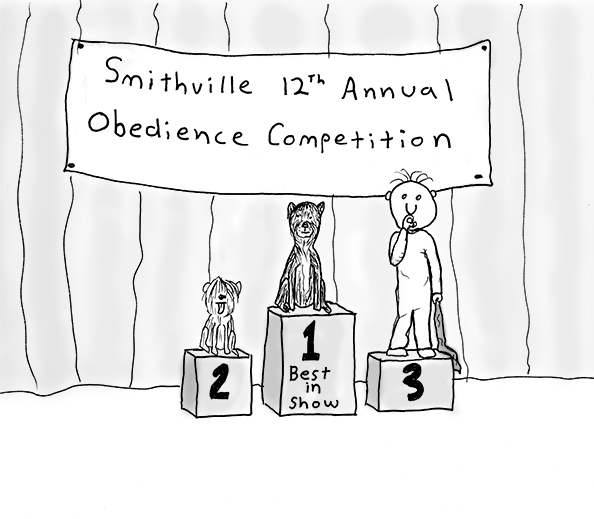 So I thought it would be nice to do an all-cartoon post today. The cartoon above was originally a crappy little drawing I did before I got more serious about making crappy little drawings. I redrew it a few days ago and here it is. 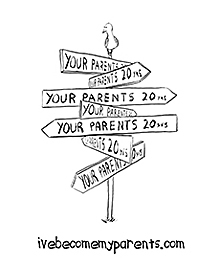 The idea came to me when my son posted a “keep out” sign on his door and I realized it was one of the first signs (literally and figuratively) of an impending puberty. I thought about all those movies where the soon-to-be werewolf shuts himself in the room just as the moon begins to rise, insisting that the door remain closed for everyone’s safety. Every once in a while I end up with a drawing but no punch line. 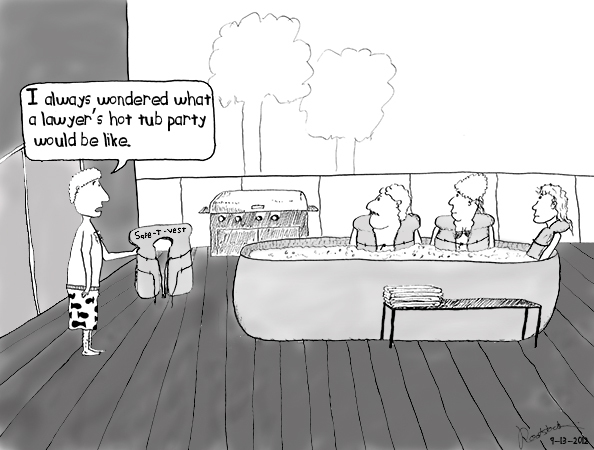 The cartoon below was one of those. I thought it would be fun to let others take a shot at generating a punch line for me. I took it to a group of dad bloggers to see what they could come up with. The winning quote for the guy holding the lifejacket came from Idaho Dad who writes a great blog that you’ll find right here. 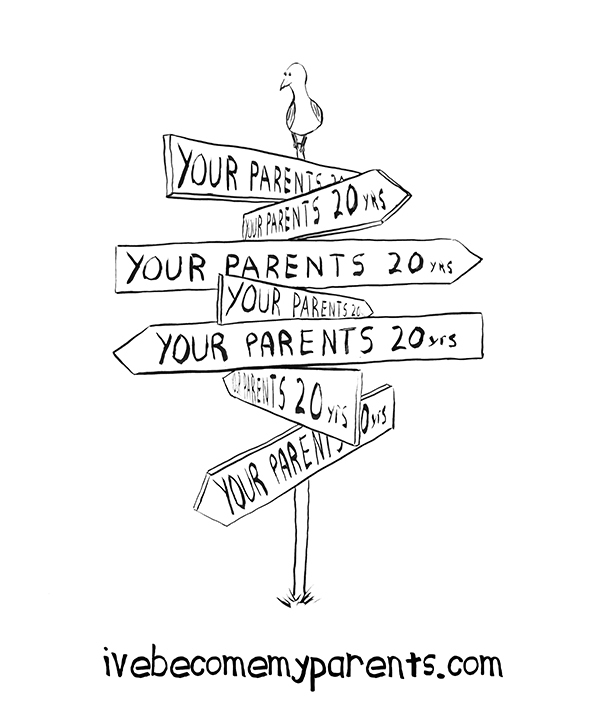 He’s a 17-year stay-at-home-dad veteran and writes about various aspects of being a parent. Go check it out. 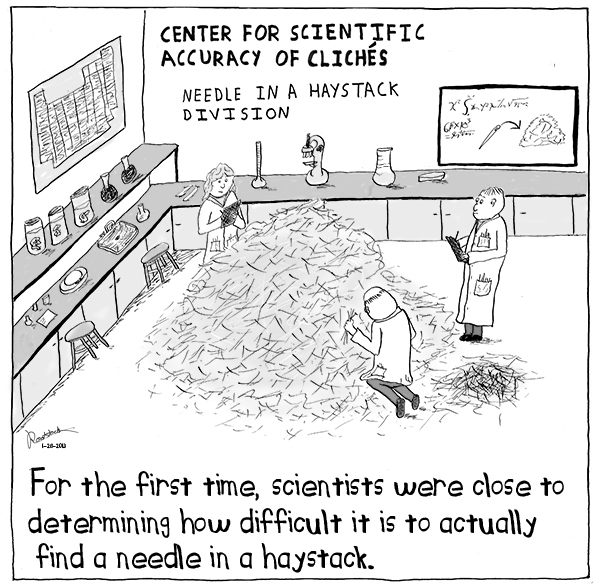 Just how hard is it to find a needle in a haystack? It turns out we’ve been using this cliché all this time and nobody knew how hard it actually was. Well it’s about time somebody did something about that. 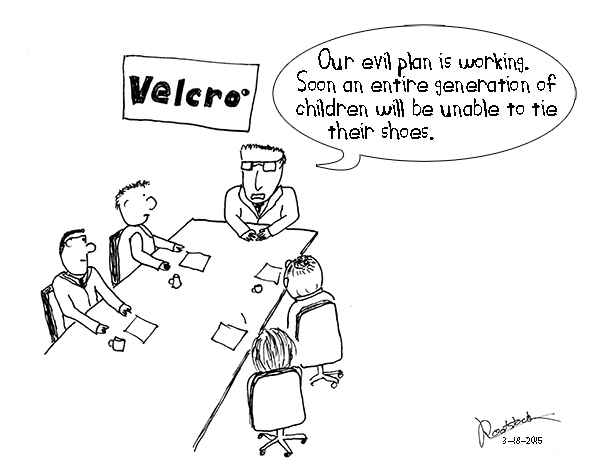 The last cartoon came to me as I watched my son close up his shoes using Velcro and realized that he was nearing 10-years -old and still had no idea how to tie his shoes. Thanks, Velcro. Well, that’s it for now. Back to our regularly scheduled programming next time. See you then! The puberty one is genius! Thanks, Ana, and thanks for coming by! You were right on target with the Velcro cartoon. Part of the entrance exam for kindergarten has always been knowing how to tie your shoes (because mom wouldn’t be there to do it). Now all they have to be able to do is wipe their butts, and I’m not sure the kids of today can even do that! I can tell you with authority that no, they don’t know how to wipe their butts. Sad but true. Thanks for stopping by Cathy! Last one is perfect….I had same concern! Mine has actually outsmarted them all…..he just gets them tied once and never unties them! Thanks, George. I appreciate that you stopped to comment. I’m a scientist by training.. and I can therefore tell you with some authority that the Needle in a Haystack Division need….a magnet. See? Leave it to the scientists to have the answers! I’d just be reaching in there and checking my finger for blood every minute or so. I like your way better. Here’s something funny I found while surfing blogs. Its about cartoons. His drawings are awesome. And thanks for reblogging with the nice comments! I’m sure you don’t look half bad. My wife and I wanted to bury our kids at 12 and dig them up again at 20. We didn’t, and we still sometimes liked them during those years in between, but they certainly didn’t like us much!! Now they are adults and they keep apologizing for how they behaved. We tell them that we were exactly the same and that their kids will be too. Nothing much changes does it? Ooh I like the teen years time capsule idea! I figured I’d crawl under my bed and come out in 8 years or so, but your way makes much more sense. And no, nothing much does change. That Velcro picture is a replay of a similar scene enacted 100 years ago when the ACME Shoelace Company was rubbing their hands in glee at having sunk the button shoe industry. Hahaha I bet you’re right! It’s all one big circle of conspiracies. Hey, wait, you weren’t gonna leave without commenting, were you? Ha! Nice catch line, I was just wandering by and saw a very small cartoon. I Never could resist cartoons, they’re not the same as jokes, stories or photographs, and have a different appeal, though I’ve no idea what makes them special. Peanuts, Calvin and Hobbes and similar have a huge audience, not to mention Marvel Comics. I guess you must be on the right track. I can’t draw, though to be honest I don’t think I’ve not practiced, I concentrate on words, which must indicate a dyslectic perversity of some kind. Good luck. Thanks, englishjim. I only recently (3 years ago or so) discovered I enjoy cartooning. Started doing it because I was too lazy to search the web for pictures I could legally use. Who knows, you may have it in you if you give it a try! I don’t assume I’ll ever become the next George Shultz but enjoy doing it and that’s good enough for me. Stranger things have happened. I achieved an Art ‘O’ level in ’72 using the technique of Sexton Blake. Perhaps I should revive these skills. Thanks. The accidental bunny ear technique is one to be proud of for sure! BTW, there’s a whole page of cartoons that you can find by clicking on the “IBMP Cartoon Gallery” tab at the top of the page. Thanks again for stopping by and commenting! Hi, I think your blog posts are HILARIOUS. I really look forward to reading more of your work… Fantastic. Don’t stop. I love the Puberty cartoon! Actually all are so great! Its amazing how we think in pictures and it really does paint a thousand words. Would you mind if I repost this to my blog? Nope, don’t mind at all. Thanks for reading! 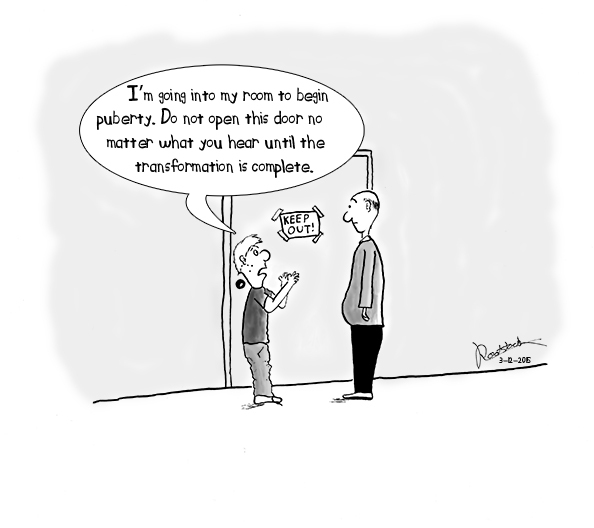 i love the puberty cartoon! I thought my followers would get a chuckle out of this like I did. Kudos to Barmy for his Excellent work! Really enjoyed all of these cartoons. Great work.